F itba coverage is an airt whaur Scotland absolutely excels. Fir in-depth coverage o the gemme, humour, tactical analysis an baith guid- an ill-natured blethers forby we are heid an shouders abuin maist o oor neebors. Ilka nicht on the radio ye hae Sportsound wha, wi their unparalleled access tae the inner sanctum o maist dressin rooms aroon Scotland gie the nation a blythe blend o rumours, gossip an genuine insicht intae the bonnie gemme. Then -och!- Setterdey comes aroon, then yer in fir the real quality gear. Off the Ball wi Stuart an Tam is the funniest radio shaw aroon. Its mair iconoclastic nor the Proclaimers an as culturally deep an resonant as the warks o Burns. An syne the banter o Open All Mics, whaur sae mony as a dizzen cheils fae aa the airts an pairts o Scotland are pit ontae ae braidcast, ilka ane descrievin a different gemme aroon the country. They are like yappin husky dugs aa boufin an bealin, marshalled bi the imperious host Richard Gordon, chairgin through the wild laun o Setterdey at 3pm. Syne, win lose or draw, Sunday nicht sees ye at hame, baffies oan, settlin in tae a bitty Sportscene. Scotland is as guid as ony ither airts whan it comes tae fitba braidcastin. This maks Warld Cup season aa the mair dulesome. Tae ging fae cheils an lassies reportin back fae a dreich an dour Livingston v Partick Thistle relegation play-aff like it’s the enn o the warld, tae Russia whaur twa English bawheids bore the bahookies aff each ither wi their tedious commentary is a gey sair dunt indeed. The fitba o Russia has been a decent spectacle sae faur. Yet the lads sent owre fae the BBC tae cover the gemmes soondit like they were daein a forced fitba podcast fae ane o the auld Siberian Gulags, leukin on scunnert as twa teams o jeelit prisoners blootert a baa atween theirsels. Ony gemme that didnae affect England in some wye seemed tae basically be a deid rubber tae the commentators. Backgrun an context tae the teams were gien rarely an sparely. Syne in cam Ally McCoist. He roared in aboot like a bairn wi owre muckle sugar in him, squirtin his patter pistol aboot like a watter gun on a simmer’s dey. Ye feel that he cannae credit his luck that he’s there at aa, which is probably nae far awa fae hou ony laddie fae East Kilbride wad feel in his sheen, millionaire or no. Richt awa, through Ally, we were aa transportit tae the Greatest Shaw on Earth. He soons like ane o oor fitba-daft pals, an doesnae tak the warld owre serious, which is hou it maun be gin yer Scottish. 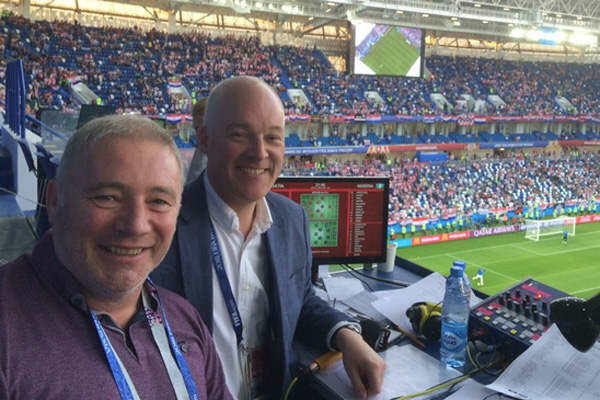 The Warld Cup is like a muckle mental foreign pairty, an Ally McCoist is pleyin the role o oor wee pal that wangled an invite an is noo on Skype tae us, gien us the inside scoop live as its happenin aroon an aboot him. He’s oor man on the grun, oor reporter on the scene. Ae noo-famous interaction stertit wi co-commentator Champion speirin o Ally; “You are trying to tell me that in Brazil, in Germany, in every country around the world, UNIVERSALLY, Archie Gemmill’s goal for Scotland is considered the best World Cup goal?”, the wee skinkle in Ally’s ee wis near audible whan he gied the repone “If they’re going to be honest with themselves, yes”. 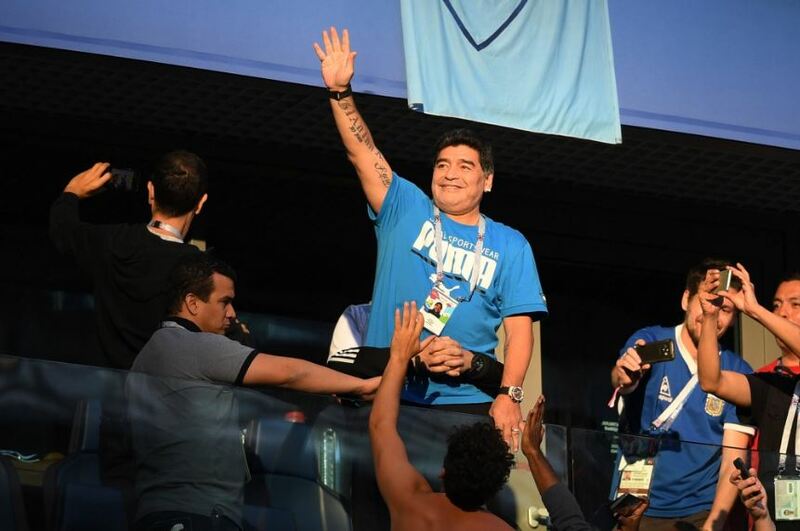 The same dey, Gary Lineker insultit Maradonna, claimin that he’s at risk o bein a lauchin-stock. Tae Ally, an tae us, Maradonna has aye been clappit wi the Haun o God tag an is the source o muckle merriment. I ken it’s ainly fitba, I ken it’s jist haivers aboot auld pleys, but the moral o the story is that we are seein the warld through anither culture’s lens. We dinnae need tae thole this state o affairs ony langer. We can dae media oorsels. Indeed, we can be affa guid at it, as oor exemplary domestic fitba coverage shaws. Forby bi daein it oorsels we mak it mair approachable fir audiences, mair real, mair couthie. Which brings me tae the news o the wik: the new BBC Scotland channel, launchin in February 2019. The lourin channel is noo ae-fit nearer tae becomin reality, efter Ofcom apruivit it this wik. Noo, the thocht o mair BBC Scotland will gar maist o ye grue. A televised version o Call Kaye onybody? Eh, naw cheers, I’ll just drap intae the watter wi the heavy bits on. But haud on. Scotland is fouthie wi real quality media the noo, an its ainly bein stifled wi a lack o funds. Gie a wee bit thocht tae whit the 32 million pund they’re gien tae big up a new channel could achieve? A new channel will gie us the infrastructure tae hae a new media, wrocht in wir ain image. Let’s be gallus an gang as faur as oor imaginations tak us. I ken it’s the BBC, an they’ll no get it richt tae stert wi, but let them big us the means o media production. We’ll hae it aff them afore lang. Imagine the potential o an Independent Scottish tele. Switch on the tele whan ye get hame fae wark. It’s Politics the Dey wi Lesley Riddoch, an here’s Lesley skelpin some puir wee craiter o a minister wha’s hud the brass neck tae come on her shaw unnerprepared. Later on is a braw wee hauf hour o coverage fae oor Scottish correspondent at the Stormont, whaur a cobbelt thegither tattie-bogle o a pairliament is tearin itsel tae targets aince mair. Owre on the ither side Still Game repeats are on maist nichts. Syne yer twa lads fae Scotia, the new digital discussion shaw wad be in Brussels ae wik, Dundee the neist, haudin court an sperin intae the bigger issues o modern Europe, instead o daein their programme fae the bottom o a tuim swimmin baths. Gaelic wad be brocht in fae the cauld. The noo it sits aff in isolation. Like a lassie in a menstrual hut on the edge o a medieval village, it is baith pairt o us yet separate, unco, ither. I wad threap fur Gaelic programmin, wi subscreivins, bein brocht intae the general ootput o Scottish tele. Hou should we no hae gaelic as pairt o the normal programmin, seein as it’s yaised alang wi English owre a guid skelp o oor country? It wad, I am shair, brak doon the barriers atween the Gaelic an non-Gaelic spikkers. Hou can a body unnerstaun whit Gaelic is aa aboot gin they ainly read aboot it in hostile press? It wad hae the upshot o makkin BBC ALBA intae anither multi-lingual Scottish Channel, gien us as a nation twa advert-free platforms. There wad be nae ainly room fir aa the current talent but a hail new generation o camera operators, producers, presenters, soon sorters an aahin else wad be brocht through. Scots leid wad o course feature heavily. Billy Kay could dae specials follaein the traivels an travails o Scots owre the watter, an dae it in Scots, English, Russian or whitever leid suitit his needs best. Liz Lochhead could hae a regular poetry slot atween programmes. I masel bagsie daein the Scots sports reports. The domestic fitba coverage wadnae change owre muckle but. I like it fine the wey it is. If you value independent media – support us. We don’t take advertising or hide behind a paywall. We survive solely with our readers support.